There is that initial anxiety when it is announced that a much loved character is making their way to the big screen. It feels inevitable that every character from our childhood will eventually be sold to the highest bidder. The most common result is that of the Transformers and Teenage Mutant Ninja Turtles variety (damn you Michael Bay). It may appeal to the younger generation, with snazzy effects but it loses its original charm for others. This fear crept in when Paddington, the great British bear’s first feature film was announced. The film was to be done in live-action instead of traditional animation and Paddington himself was to be created using CGI. The warning signs came in fast and thick that this was heading in a bad direction. The teaser trailer showed potential with its humour then a full length one offered hope of a heart-warming story. The end result for Paddington – the movie – is the rare combination of a film that retains its charm while adapting to its new format. Paddington follows the adventures of a small bear from darkest Peru who is sent to London by his aunt to find a home. Despite believing that London is an all welcoming place what he finds is quite the opposite. 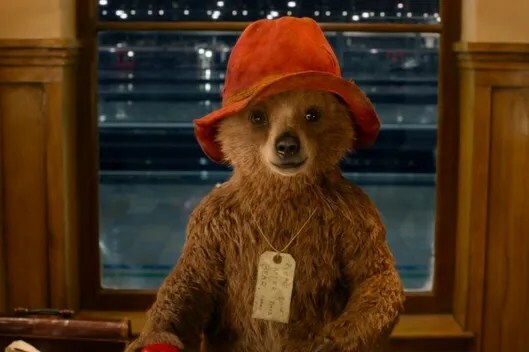 Sitting at a train station the bear is approached by Mrs Brown, (Sally Hawkins) who agrees to take him home and names him Paddington, (after the station she finds him in). Despite initial protests from Mr Brown, (Hugh Bonneville) and her daughter Mrs Brown tries to help Paddington locate the explorer who told his relatives he would be welcomed. As he stays with the Browns the family all warm to him but someone in London has a very sinister plan for the small bear. The film is of course based on the classic characters created by Michael Bond. Directed by Paul King of The Mighty Boosh fame and produced by David Heyman, the man behind all eight Harry Potter films as well as the up and coming Fantastic Beasts and Where to Find Them. The film was ten years in development looking for the perfect script as well as advances in CGI fur-rendering to create the titled bear himself. Despite this long period the film makers have done a brilliant job of adapting the story for the screen. The “series of events” format that the books follow would not have worked in a feature so here the back stories of each character have been expanded. Paddington’s home and family in Peru are shown more as is the tale of the explorer who gives Paddington’s family his hat. Here the Brown family are slightly fracture when they find Paddington. Mr Brown and daughter Judy are reluctant to give him a home which creates the conflict to overcome in the film. As you watch the family interact you see that the small bear is what can mend the gap between them. Despite these small changes the film keeps in all the staples of the characters and story. Paddington, though well intentioned, is accident prone and able to create all manner of mischief. He also still loves his marmalade sandwiches. The setting of London is as much a character as the great bear himself. Paddington must learn the ways of London such as the underground and a hilarious scene with a palace guard. We see him accidentally adorn a policeman’s hat as well as follow a route-masters bus. Audiences watch as he learns the perils of feeding a single pigeon with a film that is brimming with British wit. This is very much the forming of the Paddington bear we know and love. From his Aunt placing the ‘please take care of this bear’ sign around his neck to the moment he’s presented with his blue duffle coat. With ‘two sandwich compartments and wooden buttons for ease of paw’. The film has also retained the warmth and kind message of the books. You watch the family fall in love with Paddington and accept him into their home. It is a genuinely sweet film that reminds audience to be nice to those in need. Ben Whishaw lends his young and innocent voice to Paddington bear. Able to make him mischievous yet polite and lovable. Hugh Bonneville and Sally Hawkins head the two sides of the Brown family. Originally at odds over Paddington, he soon brings the family together. Bonneville in particular brings much of the films humour with his cynical manner and British stiff upper lip. He ever dons a bit of drag in a brilliant sequence. British institution Julie Walters has the small but hilarious role of Mrs Bird, the Brown’s eccentric relative. All the while Nicole Kidman plays the films icy villain with ease. Her plan to stuff Paddington to display in a museum may be cruel but is offset with great comic timing from Kidman. Including a sneaky One Foot in the Grave reference. A sweet and charming big screen adaptation of a British classic. Fall in love with Paddington and watch a masterclass is adaptation. Paddington 2 is out on DVD and Blu-Ray now!